Get ready to enjoy both series 1 and 2 of the heady combination of maths, science and comedy that is Domestic Science. 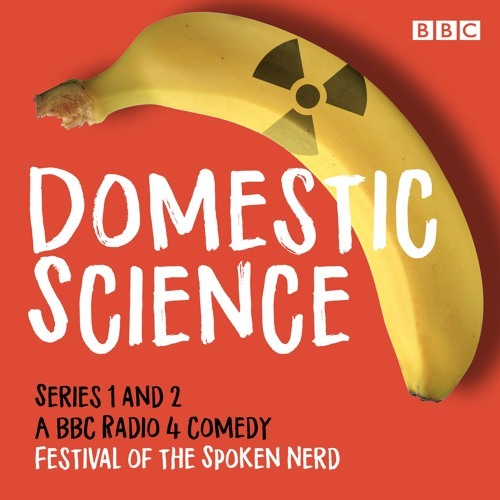 Featuring Matt Parker, Steve Mould and Helen Arney as Festival of the Spoken Nerd, these 8 episodes use stand-up, songs and experiments to investigate the world around us with a level of scientific accuracy not normally found in your average comedy series. If you've ever pondered where the mint in your toothpaste really comes from, or wondered what The Hot Chocolate Effect is, then come explore and play along at home. The team also investigate everything from radioactive bananas and musical bicycle tyres to assisting you with mathematically efficient sock storage and how to host your very own static electricity party. UK science comedy phenomenon Festival of the Spoken Nerd created this truly experimental radio show for BBC Radio 4, alongside appearances on BBC2’s QI and sharing stages at the Hammersmith Apollo and Royal Albert Hall with comedian Robin Ince, Professor Brian Cox and Commander Chris Hadfield. They toured their most recent stand-up science show to over 50,000 curious nerds (and non-nerds) and have accumulated millions of views on YouTube for their stand-up maths, songs and science explanations.